JPL is in the process of developing a high spatial resolution mean emissivity database from all available ASTER data ever acquired since launch of Terra in Dec. 2000 - termed the ASTER Global Emissivity Dataset (ASTER-GED). ASTER GED is currently completed for all major non-frozen land masses (see image below) and has been released for download from the EROS-LPAAC. Validation over a global set of sites showed a close match in spectral shape with lab measured spectra, and average band error of ~1%. ASTER GED was initially released for North America as the North American ASTER Land Surface Emissivity Database (NAALSED) v3.0, a mean seasonal emissivity dataset for summer (Jul-Aug-Sep) and winter (Jan-Feb-Mar) time periods using data from 2000-2012. In order to obtain better coverage over more sparsely observed regions, the ASTER GED uses all ASTER scenes ever acquired from 2000-2008 to calculate a mean emissivity climatology. ASTER GED is currently available at the EROS LPDAAC for all major non-frozen land masses of the globe. More detailed information on the NAALSED and ASTER GED products can be found at the LP DAAC, and can be ordered from Reverb. ASTER GED is available in 1x1 degree tiles at ~100m and ~1km spatial resolution and products include emissivity (5 ASTER TIR bands), surface temperature, NDVI, land-water map, geolocation information, observation count, and the resampled ASTER-GDEM. The image below shows the ASTER GED emissivity product resampled to 5km for ASTER band 12 (9.1 micron). 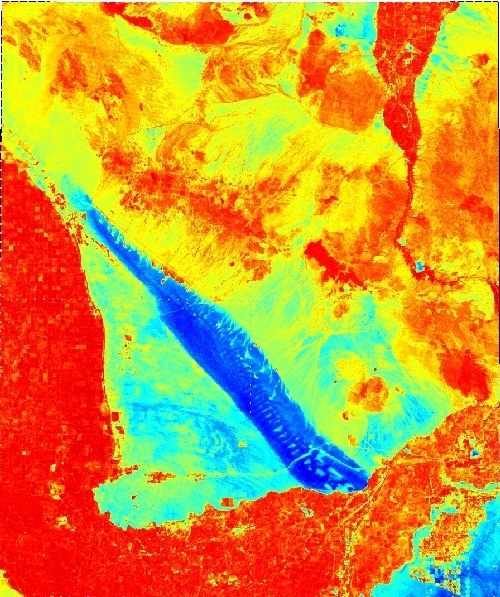 The image below shows a 1x1 degree block of ASTER GED emissivity for band 12 (9.1 micron)over the Salton Sea area of southeastern California at full resolution (~100m). Crest and troughs of the Algodones dunes can be distinguished (blue area), as can individual crop-fields of the Imperial valley to the west and south of the dunes. Validation of the emissivity product can be found in the Validation section.